When thinking about skiing in the United States, many locations come to mind.One high ranking destination in particular is SUN VALLEY, IDAHO. The fame of this ski destination has continuously been a spot light for all snow lovers!! Sun Valley, located in Blaine County Idaho is the oldest ski resort in the United States, and is home to the first chairlift IN THE WORLD. Over the years, Sun Valley has been the preferred ski resort to some of the biggest names in the world, including Ernest Hemingway, Ashton Kutcher and Demi Moore, Peter Cetera, Clint Eastwood, and Tom Hanks. This mountain is one of the training ground site for Olympic level athletes. In the mid 1930's the Chairman of the United Pacific Railroad, William Averell Harriman, who was an avid skier himself, wanted to bring alpine skiing to Americans. He wanted a ski mountain that could equal those found in Europe. Since then, this resort has been a premium ski resort in the United States. 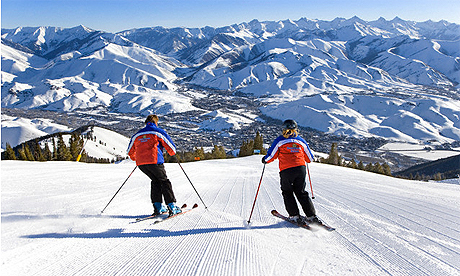 Sun Valley is most famous for its two alpine ski mountains: The Bald Mountain or the “Baldy”, and the Dollar Mountain, and its ability to accommodate skiers of all levels. The Bald Mountain is undoubtedly one of the best skiing mountains in the United States. Skiers absolutely love the absence of wind, the constant-pitch terrain, and the vertical drop of 3,400 feet. The Bald Mountain, at its summit, stands at 9,150 feet tall. The height of this mountain is perfect for high level skiers! The Dollar Mountain, on the other hand, is the haven of the beginners. It is a treeless mountain, with a summit height that measures 6,638 feet and has a rather moderate vertical drop of 628 feet. Today, Sun Valley Ski Resort has a total of 18 lifts that can accommodate 28,180 people in an hour, and 75 slopes that cover 2,054 acres!! Contact a Sun Valley Specialist at 888-754-2167 to receive information about booking a vacation!! !